Iconic skin-friendly brand Clinique has been moving more towards more fashion orientated products recently, and after the success of their summer collection, they’re just about to launch a great new line of lip glosses that’ll appeal to everyone. The Vitamin C Smoothie Lip Gloss is a cute range of ten shades that are bursting with moisture, anti-oxidants and of course vitamin C to keep your lips in tip-top condition. They come in a brush style applicator, so no sticky-ness all over your bag like you usually get with traditional wand-style lip gloss. 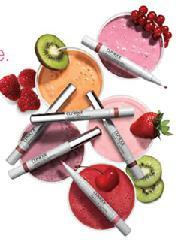 Flavours/shades will include strawberry, raspberry, kiwi and cherry. You can sign up at the Clinique website to be notified when they hit the stores.